Photo © Vincent Roazzi, Jr. Facing wild beasts real and imagined on a hike to Bhutan's most famous monastery. It’s the most peculiar survival advice I will ever receive, bestowed by a Bhutanese gym trainer during my routine workout in one of the country’s only fitness clubs. “If a bear attacks you, hit him in the nose – his life force – and he will die instantly. If a bear walks up to you and smells you breathing, then he will attack you. Chencho is not joking, especially not about the yeti, or migoi as it’s known in Bhutan. I’m confused, but I’m not surprised. I’ve lived here almost one year, working for the travel portal MyBhutan, and I struggle every day to figure out this spiritual, folkloric, and often magical culture. Indeed, I consider it healthy to question everything in life for the purpose of knowing. Lately, however, I’m starting to wonder if skepticism is my easy way out of truly understanding the grayer areas of the world. 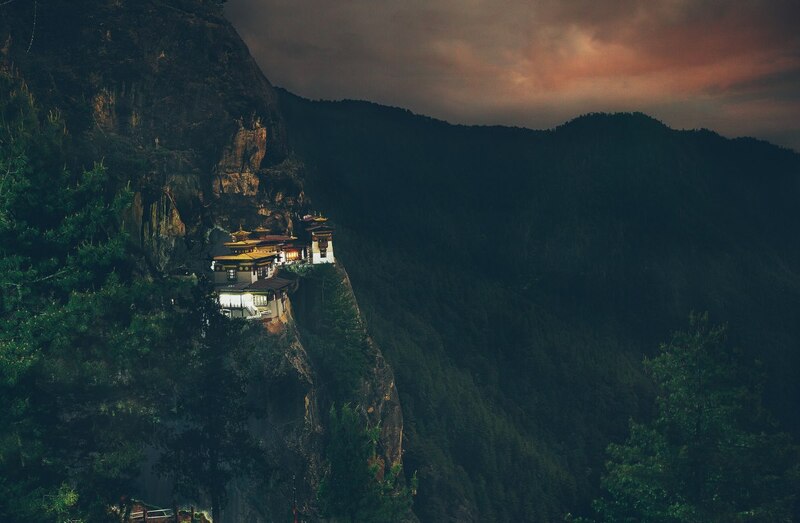 I approached Chencho for advice because, in one week, I will hike the mountains at night for the rare opportunity to capture a midnight portrait of Tiger’s Nest Monastery. This past week, my daydreams have been haunted by black panthers, tigers, and Himalayan black bears. I have reason to be concerned – monks recently talked of a bear that visited the temple doors, lured by the smell of butter lamps. In my dreams, however, the meeting is more of a clawing, uproarious occasion. Tiger's Nest, as seen halfway through the trail on an earlier. daytime hike. Near the entrance of the temple, Buddhist pilgrims follow a narrow stairway. The bear would have followed a similar path to reach the temple doors. At 10pm on a Friday night, I start at the base of the mountain. I'm accompanied by my friend's nephew, age 18, who's just as timid about the trek as I am. My flashlight beams a short cone of light towards a dirt trail disappearing into the trees. Deep belly growls ahead preview the sight of stray dogs surrounding us. Heavy scars across the dogs’ bodies warrant their claim to this territory. Wooden tables left behind by villagers vending good-luck charms during the day have been flipped and lie scattered. We carefully step through the scene, tensely gripping my tripod until the growls quiet behind us. With this early spike of adrenaline, we continue up the mountain in haste. Bushes shake and branches crack from each direction. “Something is following us,” I say to myself. Feral dogs bark near and far – I gauge their distance like a bat. Insects crowd any potential gap of silence, frogs hop across my feet. Predator eyes gleam in front of me, to the side, and from behind. They are everywhere. Indeed, we are being followed. I hear a treble bell ringing in the distance. We meet a spinning water wheel standing in the middle of the creek, decorated in gold Tibetan inscriptions. Its spin is generated by the water’s downstream energy on an infinite loop. Each spin is said to charge the water with divinity – but in truth, I only consider it novelty. “I’ve never done this right before,” I think to myself, “I’ve only done it out of respect for culture.” I look at the ghostly wheel and consider a hidden, divine force, one that could potentially protect me from a beastly nemesis. I recollect other times in my past where I reaffirmed prayer amid dire circumstance, a predictable notion that should never take me by surprise but always does. With my flashlight pointed at the glimmering fountain, I cup my hand, take a sip, and focus on the water performing its duty. 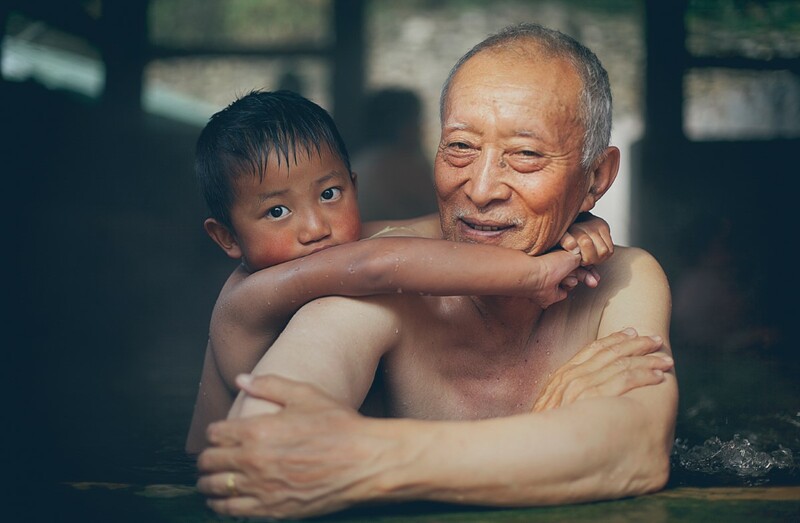 Far away in Gasa, Bhutan, an elderly man vacations with his grandson at the holy hot springs. 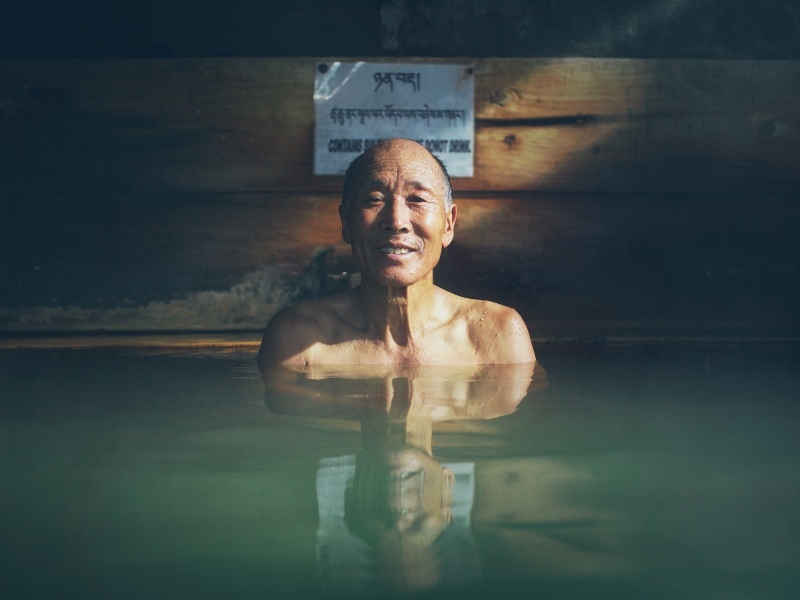 The elderly come from all over Bhutan to bathe in the blessed holy hot springs of Gasa. The waters are said to cure all ailments after a day's soak. 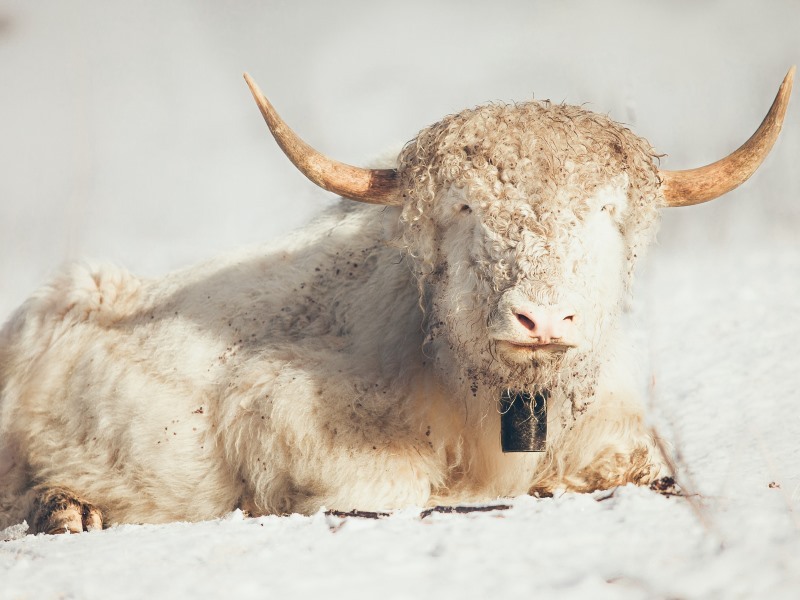 The yak is the most coveted animal in higher altitude areas of Bhutan. Every part of the animal is used to clothe, feed, and transport materials for the Bhutanese. After an hour of hiking, a new pack of feral dogs is catching up to us. We’ve been carefully outpacing them, making sure not to flag ourselves as fleeing prey. As they close in, I sense they are harmless and sociable – less successful fighters than their foes at the base. Buddhists here consider dogs equal in the spiritual ranks to humans, which makes dogs well cared for around the country. To the Bhutanese, these dogs aren’t just cute pups – they are infinite beings taking various lifeforms. I know these curious followers smell the sour cream potato chips in my backpack, the bag puffed out and about to pop because we are so high in elevation. I welcome them eagerly, as I’m desperate to have members of the animal kingdom on our side. At this point, we're more than half way and turning back would maintain the same risk – I’ll worry about our descent later. We quickly become a troop, strutting up the mountain with our chests out. The worries and thoughts within my mind start to quiet. The sound of my steps up the mountain put me deeper and deeper into a trance. The night is brighter now, or so it seems. I look up at the moon and am grateful for the little light it can provide. I realize I’ve never thought this before, and smile. 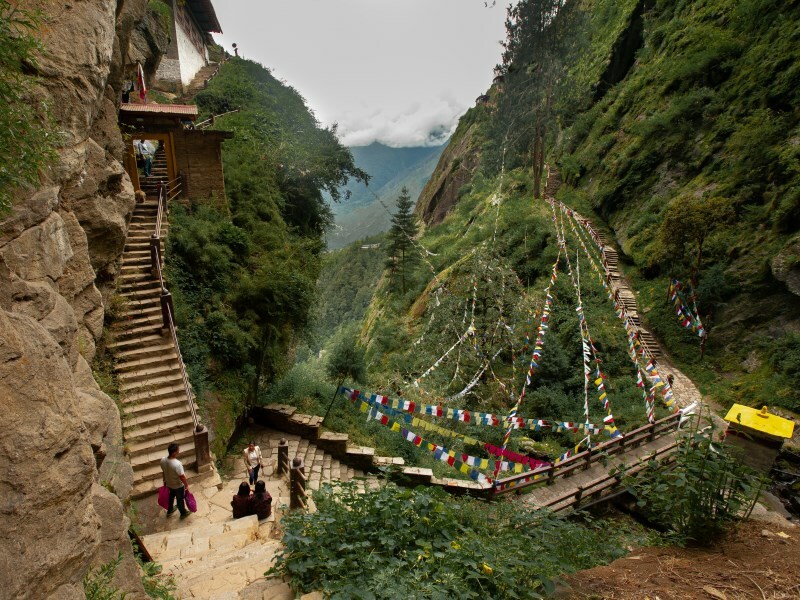 With the whipping sound of prayer flags, I know we’ve reached the final cliffside trail. Standing seven feet tall, these white prayer flags have been raised in memory of the dead, and decorate every acre of Bhutan, especially at the highest peaks where the winds are said to carry their prayers. Lichen, or “grandfather’s beard,” sways from the cypress trees, a signature of pristine air. 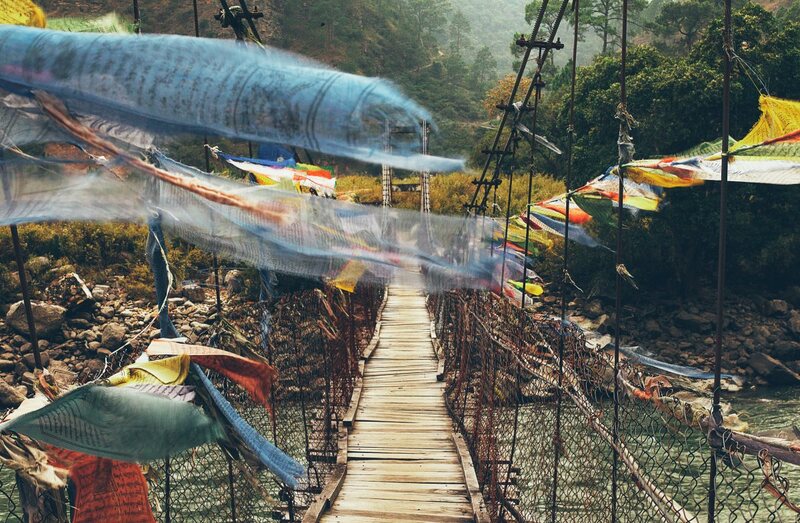 Besides mountain tops, bridges over Bhutan's rivers are most commonly decorated in prayer flags. Every person who crosses these holy waters walks a supremely divine path. 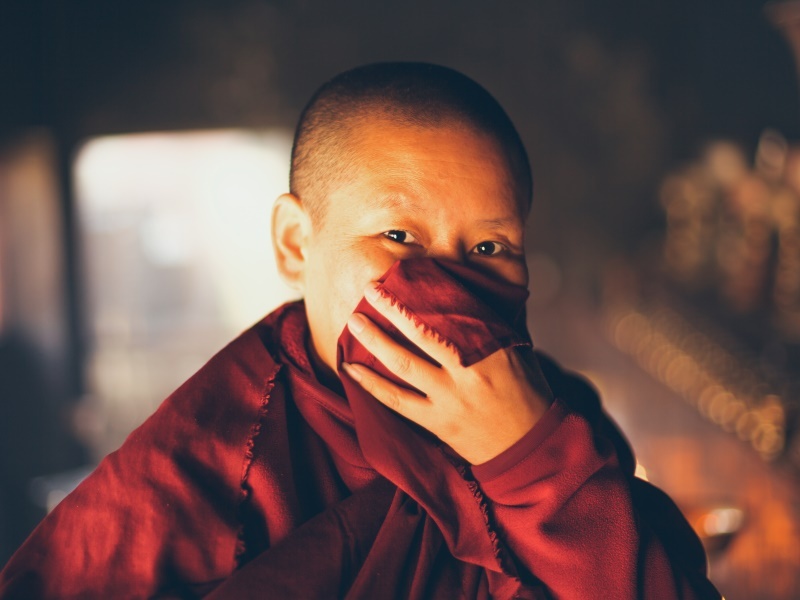 A nun covers her mouth and nose while lighting butter lamps inside a prayer room. Another large prayer wheel stands atop the mountain before the final path. The wheel is still, and requires human force to generate its spin. Again, I feel compelled to follow the rituals afforded to me by my Bhutanese friends. I grab the handle and swing the prayer wheel around three times, an auspicious number. 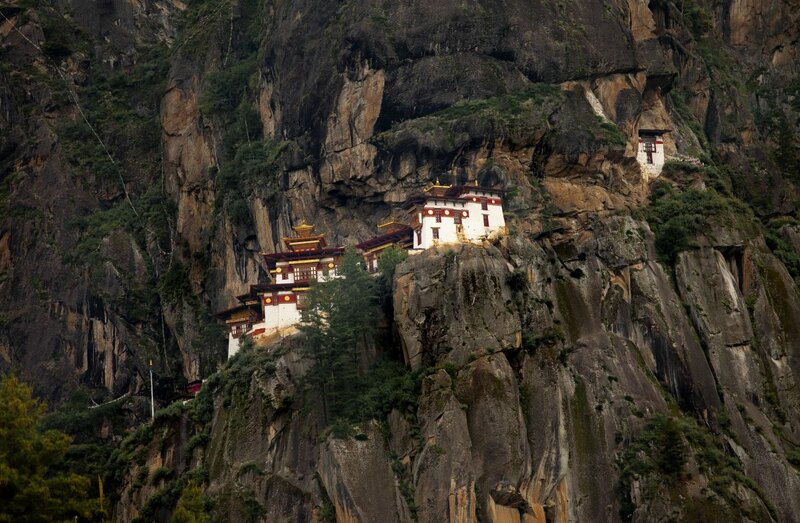 Our final paces bring us to the edge of the cliff and a clear view of Taktsang. One of my canine companions teeters on the edge, barking in the direction of the monastery. I look closer to see monks making midnight koras, ritual walks around the temple. The monks are praying for everyone and everything, dead and alive, continuously, and with pure intent. I set up my tripod for a long exposure while the dogs snack on my potato chips. I sit on a large rock between each exposure and think about my previous daydreams about this exact spot: a battle to the death against an anonymous beast, set in an arena of dramatic lighting storms. Even though we still need to descend the mountain, I know the beast and I will never meet, though part of me wishes we would. I spend an hour atop the mountain gazing at the temple, until a mist delicately brushes my forehead, hinting of rain – it’s time to go. Vincent Roazzi Jr. is a photographer from New York City with a passion for photographing people and culture around the world. Scholarship winner Allison Bradley discovers what happens when you come face to face with a legend. Alex didn’t expect this unplanned homestay in the hillside village of Kuenga Rabten to be a highlight of her trip to Bhutan. We uncover Bhutan’s phallic obsession, question the daily tariff for inbound travelers and hear why the local pigs don’t fly but do get high.